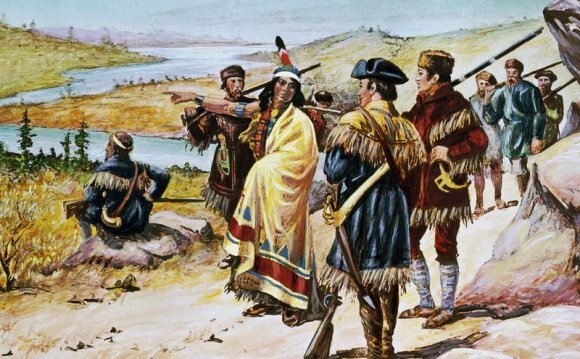 "When they shook hands, the Lewis and Clark Expedition began." -Historian Stephen E. Ambrose describing the meeting of Meriwether Lewis and William Clark at the Falls of the Ohio in his book, Undaunted Courage. The Indiana Lewis and Clark Bicentennial Commission was created by Public Law 7-2001 to highlight Indiana's important role in the Lewis and Clark Expedition and assist with events to commemorate the Expedition's bicentennial beginning in 2003. The Commission invites you to visit Lewis and Clark sites in Indiana to see where the Corps of Discovery was born and to learn about the first men to join its ranks. In October of 1803, Meriwether Lewis and William Clark spent time in Clarksville, Indiana at the cabin of General George Rogers Clark planning for the Expedition. They recruited and enlisted the first members of the Corps of Discovery before departing down the Ohio River for the west from Clarksville on October 26, 1803. In 2003, southern Indiana and Louisville, Kentucky will commemorate the bicentennial of these events during a "National Signature Event" designated by the National Council of the Lewis and Clark Bicentennial. This web site will provide you with information about Lewis and Clark places to visit in Indiana, the many Indiana events planned to commemorate the bicentennial, and the official activities of the Indiana Lewis and Clark Bicentennial Commission. If you have any questions about the bicentennial or the Commission, please contact us. Ridgefield is a city in the pastoral, rolling-hills countryside of northern Clark County, Washington, United States. The population was 4,763 at the 2010 census.